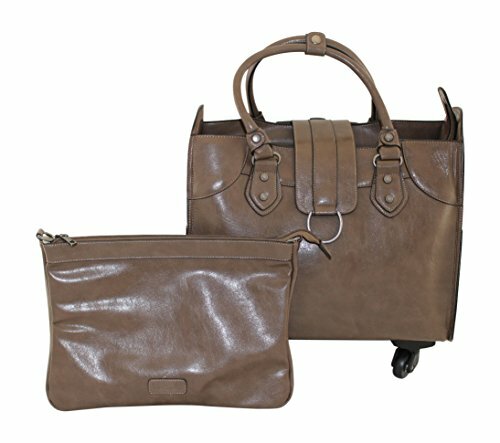 Take your business trip in style this season with Simply Noelle's Saddle Roller Bag. Featuring 360-degree turning wheels, an adjustable pull-out handle, and plenty of space for all of your essentials, this bag is a must-have for all of your travel needs. Comes with 2 snap closure side pockets. The interior features a snap off removable padded laptop case with detachable/adjustable crossbody strap, zipper pocket, ID/Card holder, pen holder, cell phone pocket e-reader pocket and a reinforced bottom for extra durability. Measuring at 17" x 10 1/2" x 16", you won't be lacking for a luxuriously spacious travel bag. The approximated size of the laptop case is 15" x 10 1/4" x 2". Measuring at 17" x 10 1/2" x 16", you won't be lacking for a luxuriously spacious travel bag. The approximated size of the laptop case is 15" x 10 1/4" x 2".